Richard Hughes completed a 9.8/1 double on the first day of Royal Ascot with a pulsating victory on the Edward Lynam-trained Sole Power in the Group One King's Stand Stakes. Hughes said: "He is made for me. I rang Johnny Murtagh and he said I was made for him and just make sure you get him covered, that's the main thing. He has a burst of speed and he'll pass anything - and he did." Hughes talked of the tactics involved: "Ideally, I was looking to make a run up between horses. He's a bit small and you can't really afford to hit a big horse on a little one like him so I felt I was going that well that I pulled him out to get a clear run. That is what riding is all about, staying under pressure and getting the job done." Hughes added: "I loved it. I had a wonderful run through, he had loads of cover and was travelling really well and when I pulled him out he went. 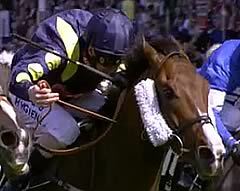 Ryan Moore said he wouldn't pull that hard and Johnny Murtagh told me to ride him like I do handicappers. He also said that I should make him nearly clip heels with horses in front as he loves that. The jockey was effusive in his praise of how much ground the horse made up: "He made up five lengths in the final fifty yards and I have never done that before. I thought at the furlong pole, we might get there but he made up so much ground late on. He never runs a bad race. He has been here for the last four or five years and he has proven how good he is." Eddie Lynam, the winning trainer, said immediately after the victory: "That was easy to watch - it was actually, you get used to it and Richard (Hughes) suited him. Sole Power was the best horse in the race - maybe now he deserves the accolade of being a proper horse. He is the first horse in 80 years to win back to back King's Stand Stakes." Paddy Power, son of the winning owner, said: "Richard Hughes gave him the perfect ride. I thought he was too far back and had made a balls-up. He knows a lot more about riding races than I do! He was last and yet won easily. It must be one of his best runs. Last year you could argue that he mugged Shea Shea but this year there was just no argument. He is seven years old and his best run was at Christmas when he finished second in Hong Kong - he is as good as ever if not better! 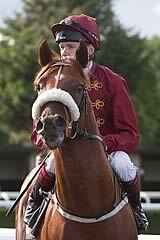 It is dreamland to come back to Royal Ascot and win a Group One twice in a row. " Johnny Murtagh, successful on Sole Power last year and now a trainer, declared: "I told Richard (Hughes) that this horse was made for him - just sit on him, get him relaxed, he has a great turn of foot, not to be afraid at the furlong-pole to be a few lengths down and, when you push the button, he will quicken up. I am delighted for Hughesie and for Eddie." 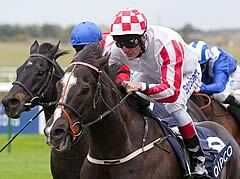 Sole Power was the first successive winner of the King's Stand Stakes since Gold Bridge in 1933/34. Runner-up Stepper Point made a mockery of his 50/1 SP. Stepper Point, who is trained by William Muir, was narrowly beaten by Sole Power and Hot Streak in the Palace House Stakes at Newmarket in April when fourth. Today he moved up two places and reversed the form with Hot Streak, the 3/1 favourite who had to settle for third. Muir said: "The ground at Newmarket wouldn't have been ideal for our horse, but he loves the going out there today. He has since had two runs in France and was as flat as a pancake, but still ran up to a good mark. "Then in the last three days he's just started sparking - he's just been saying 'I'm back'. First time out I ran him just short of work, which I don't like doing, but he won, yet I think it took more out of him than I initially thought. "Today I watched as we got past Hot Streak and I was looking for Sole Power, hoping he was trapped, because that was the only way we were going to beat him. "Stepper Point's owner, Clive Edginton, deserves all the credit. He loves going racing and doesn't mind getting beaten and he's having some great fun with this horse. He's owned some good ones like Enforcer and Enroller, but he plays sport and says if I worry about getting beaten I'd never pick up my golf clubs. "When I started training I took things personally, and it would have got to me to think he was a 50/1 shot, but not any more. If the owner has £50 each-way at 50/1, happy days. I couldn't see how the favourite [Hot Streak] was 3/1 and we were 50/1 given that we were a neck behind in the Palace House Stakes, but thank you the bookies." Kevin Ryan, trainer of Hot Streak, one of four three-year-olds in the line up, said: "There's a lot more of the season left to look forward to, but I'll have to speak to David [Redvers] and Sheikh Fahad to see what the plan is. He'll be in the July Cup, but we'll see how he in the next few days and take it from there. He'll be fine because he's so tough and consistent."